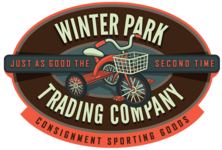 At the Winter Park Trading Company, we help people sell their gently used equipment on consignment. Our selection always changes, so stop by today to see what we currently have to offer. From snowboards, to skis and even kayaks, clothes and camping supplies, we have something for everyone.